On Sunday morning, Ebony, our Kune Kune sow, gave birth to seven healthy piglets. Mother and babies are fine, all of them up and about. 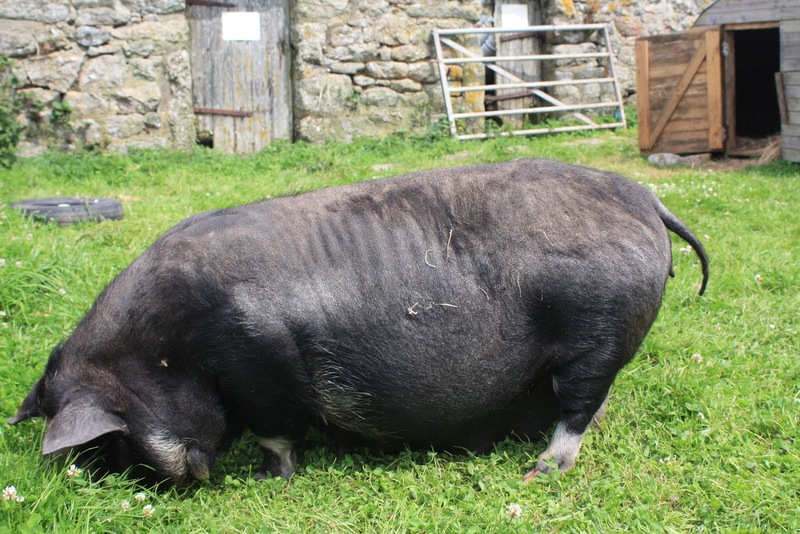 They were born 123 days after Ebony was put in with Butch, the father, with the gestation period of Kune Kune being 118 days, 2 days longer than for other breeds of pig. Ebony in the farmyard, three days before giving birth. 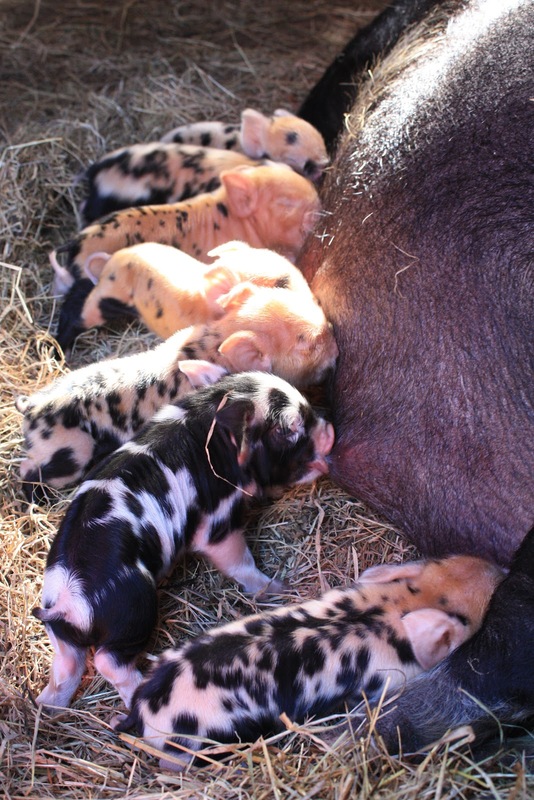 Watching Ebony and the piglets, Lea in the centre (the others are Alice, Rowena, Bryan, and another Lea). 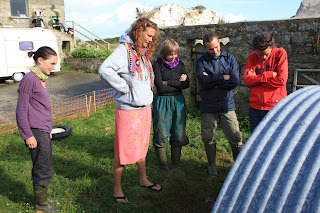 Lea, from Austria, left us yesterday after one month volunteering on the farm, to continue her WWOOF adventures picking blueberries on Dartmoor. Thanks for your help and your adventurous cooking! 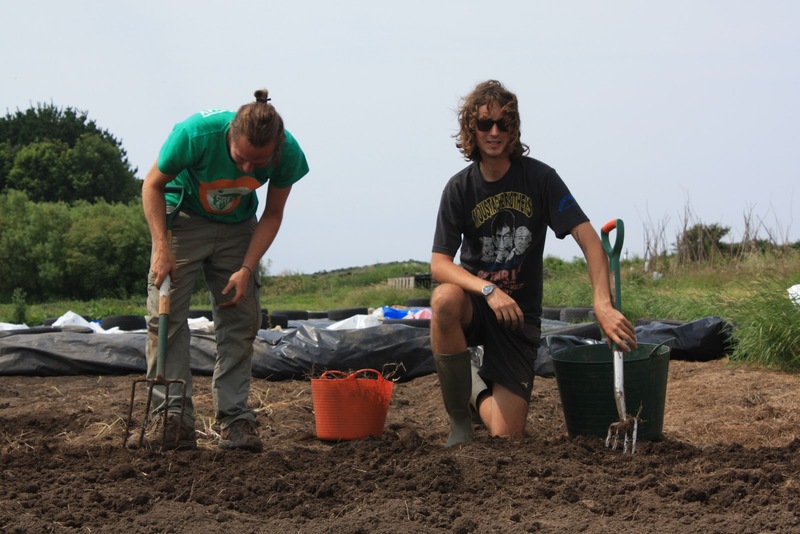 Will, from New Zealand, digging winter brassica beds with Bryan, during his recent stay of ten days on the farm as a WWOOF volunteer. Thanks for all you hard work and good humour! How to reach Bosavern Community Farm. We are located one mile south of St. Just on the road to Lands End Aerodrome, just before the hamlet of Kelynack. There are plenty of buses to St. Just from Penzance Railway and Bus/Coach Station. The “First” buses 10 and 10A are the most frequent, but the “Western Greyhound” 509 is cheaper and faster. The last bus on Sundays leaves Penzance early evening, but on Saturdays and weekdays buses run till quite late. See www.traveline.org.uk for more details. Once in St. Just it’s a 10-15 minute walk down to the farm. The bus will drop you at the main bus-stop opposite the Fire Station. Facing the Fire Station turn right and follow this road past the Post Office into the main square of St. Just (OK, it’s triangular, and has a pub on each side). Turn right and follow Fore Street for three minutes, with The Star pub on your left. When you reach the knitting and needlework/fabric shop on your right, take the small lane (Lafrowda Terrace) immediately after the shop, and follow this to the end. At the next junction cross straight over onto another small lane, and the same at the next, onto Carallack Terrace. At the end of Carallack Terrace cross the stile and follow the path along the left hand side of the field – you can now see the farm straight ahead of you. Cross a stile and keep following the path on the right hand side of the field, cross another stile and keep following the path. Soon you will cross another stile and come to a garage near some cottages. Go straight ahead down their drive to the main road. You will now see the farm across the road from you, so come on over. If there’s no answer at the house we’re working in the fields. Cross the farmyard and enter the first field, turn right and follow the path along the right hand hedge. 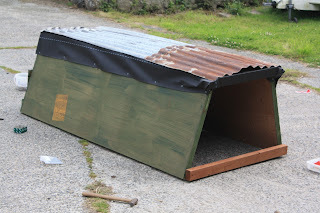 The gate in front of you leads to our vegetable field and polytunnels, and if we’re not there we’ll be in the chicken field or maincrop field, both of which are above the vegetable field. Explore the farm to find us, or just shout! 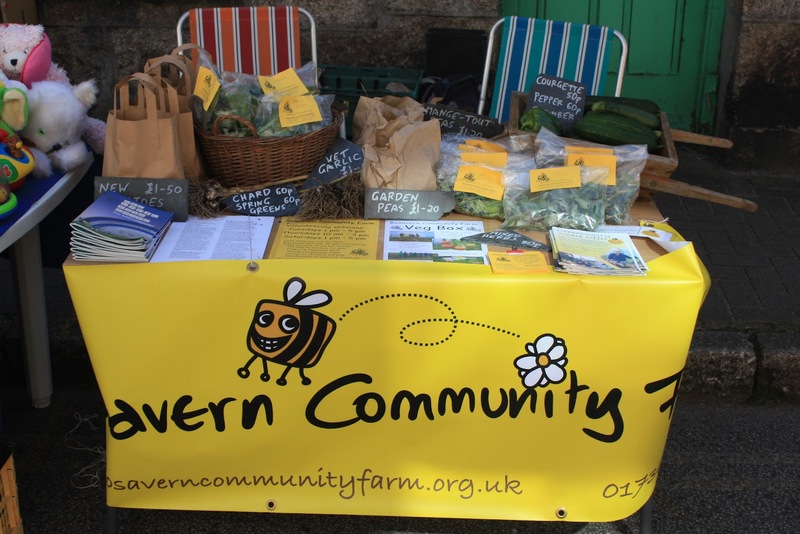 Bosavern Community Farm ran a vegetable and information stall on Fore Street for St Just's Lafrowda festival last Saturday. The annual festival is one of the biggest cultural events in the town's calender, with a street fair all day plus three processions, and an evening of live music on two stages around town. Our stall on Fore Street. 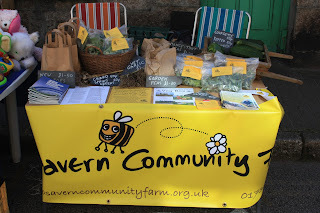 The stall was staffed by volunteers, and sold new potatoes, wet garlic, courgettes, cucumbers, peas, mange-tout peas, sugar snap peas, mixed herbs, chard, spring greens, and green peppers, as well as giving information about the Community Share Offer, veg box scheme, volunteer sessions, and local food producers. 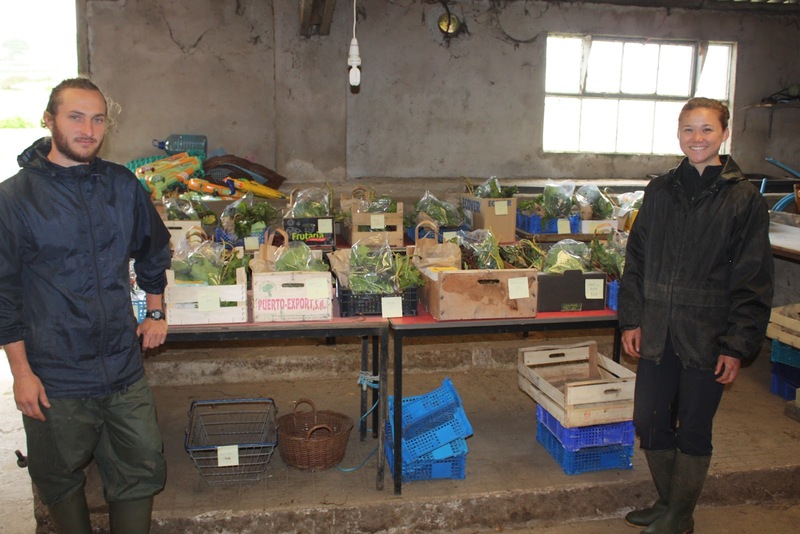 A sample of the produce on offer. Thanks to everyone who helped on the stall, and to those who bought veg and came to ask questions. We hope you all enjoyed the festival - see you next year! 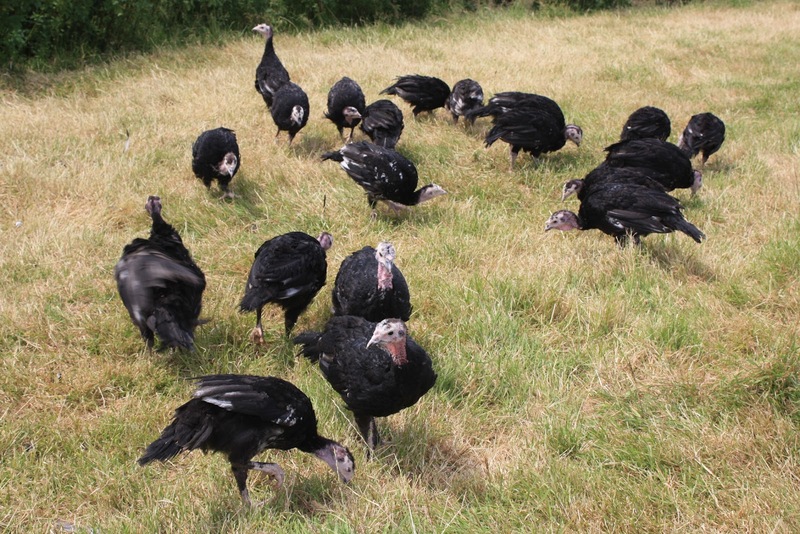 Our turkeys this year arrived on the farm on 4th July, 41 Norfolk Blacks, the same breed as last year and from the same breeder. After the awful start to the summer, they have just started venturing out into the field, pecking at the grass and nettles, and testing their wings. Some of the turkey flock exploring their outdoor run. We will soon be taking orders for Christmas turkeys, so please phone us on (01736) 788454 for more information and to book your turkey. Turkeys will be ready just before Christmas, ready for the oven. Whilst other veg box schemes are having to close due to the bad weather, we are still producing 15 boxes per week despite the miserable summer. 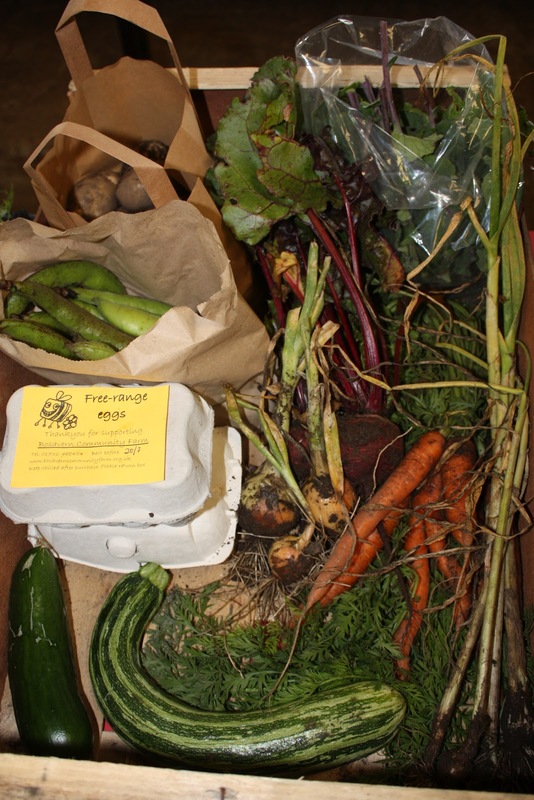 We do have the capacity for more, so if you would like support us by becoming a regular veg box customer please phone us on 788454, or call in to the farm. One of our current veg boxes. Boxes are available for collection from the farm from Friday evening at 6pm, throughout the weekend. 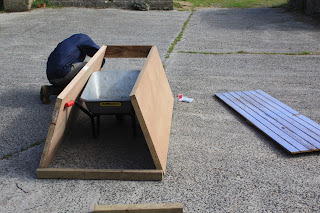 Small boxes cost £5, standard boxes £8, and large boxes £12, with eggs an extra £1.60 per half dozen. We are also now able to offer freshly baked artisan bread with our boxes, though prices have yet to be finalised. 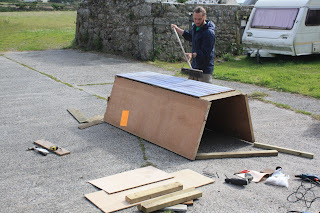 Bryan and Kristin, two wwoof volunteers, with the week's finished boxes. Boxes currently include a selection from new potatoes, cucumbers, courgettes, beetroot, mange-tout peas, garden peas, broad beans, wet garlic, onions, mixed herbs, spring greens, carrots and French beans. 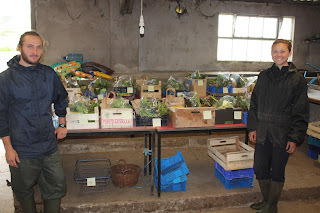 Most of this produce is also available from the farm gate, but the box presents better value and convenience. 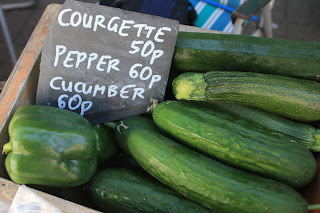 What's for sale on the farm stall today? Free-range eggs, £1.60 per half dozen. "Monster" (extra large) eggs, 30p each. New potatoes, "Maris Peer", £1.50 per kilo. Broad beans, 80p per half kilo. French beans, £1.60 per quarter kilo. Wet garlic, £1 per bunch. Fresh onions, 50p per bag. Peas in their pods, £1.20 per bag. Many thanks to Kristin from California, who recently left for Florence after volunteering on the farm for 2 weeks. Sadly I couldn't find a photo of Kristin to post! Your help was invaluable, and we wish you the best with your travels and further studies.